Back view of the lodges. Contact Lorna at Mountwood Lodges on 01764 662609 (mobile: 07814 507254) or complete the enquiry form. These high quality lodges benefit from an excellent location as a base to explore Scotland's wonderful scenery and heritage, or just a beautiful place to stay for a sporting break (incl. golf, cycling, pony trekking, fishing and more). We have a joint venture with a superb local Country Club which entitles us entry for a limited amount of guests. A gymnasium, swimming pool, jacuzzi, sauna ,steam-room, bar and restaurant are all available (details on request). Built near to one of Scotland's oldest lowground pine forest the setting was specifically chosen for its idyllic relaxing views, making it the perfect choice for your welcome, overdue rest. 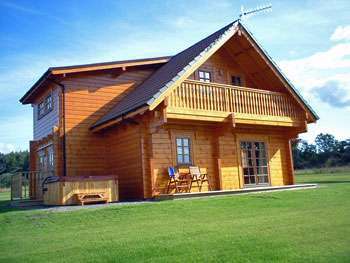 Mountwood Lodges are located approximately a mile from the village of Aberuthven, three miles from Auchterarder, just off the A9. The A9 is the main trunk route through central Scotland and runs from Stirling (26 miles to the south) through Perth (12 miles north east) up to Inverness (90 miles to the north). Other popular destinations include Edinburgh, Glasgow and St Andrews. Egyptian cotton bedlinen, towels, bathrobes and slippers, toiletries, fresh flowers and a welcome pack all included to make your arrival and stay a pleasurable experience. Please visit http://www.mountwoodlodges.com to find out more about the holiday cottage, amenities, surrounding area and places to visit in Perthshire. Nearest Train Station or Airport: 5 miles Gleneagles rail station. Recommended Places to Visit: The Famous Grouse Experience near Crieff, Crieff Visitor Centre, Black Watch Museum Perth, Stirling Castle St Andrews-historic town with most famous golf course in the world. Pitlochry-fish ladder with large viewing room, shops and restaurants. Recommended Places to Eat Out: Jon and Fernanda's Auchterarder, The Kirkstyle Dunning, *Dean's Lets eat*,Sante and Cafe Tabou in Perth, *Andrew Fairlie* at Gleneagles, Golf Club Auchterarder, Duchally Country Hotel and lots more!! Small town with limited number of quality shops and restaurants. **GOLFERS** World famous Gleneagles Hotel and Golf courses(Ryder Cup venue 2014), only a couple of minutes away, with it's extensive high-end quality shopping mall and restaurants(including Fairlie's michelin star food heaven). Auchterarder Golf course... also worth a round. Fishing on our own beat of the River Earn. Game Shooting on the farm, or clay pigeons can be arranged. LODGES with or without a HOT-TUB.